Work is well started on photographs for this years new book “The Art Of Polymer Clay Masks”. There areÂ somewhere aroundÂ 350 miniature masks in my collection from a decade of Miniature Mask Swaps with my claying friends on the Internet. I’ve had them all tucked away awaiting the time for photos–and thats now! I’ll be posting more as I go with peeks at masks from the upcoming book. Most of the masks fit inside a square 3inches by 3inches. There will also be photos of some full sized masks in the book. Its exciting, unwrapping all the little goodies from years past and taking the pics–but its daunting too. There sure are a LOT to go!! I’m lucky that each is different and its a fun, visually interesting and mentally challengingÂ project, because it’ll be consuming most of my time for the next several months. The mask seen above is only a few inches tall and made of polymer clay by Sherry Bailey, who started the first Internet Miniature Mask swap in which I participated back in 1997. 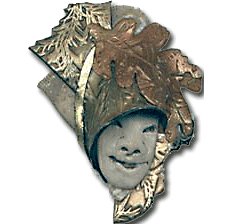 The mask seen below is also very reminiscent of a treasure from the past–but made last year by Jeanne Rhea.